Nail pops can be almost unavoidable and could appear everywhere. 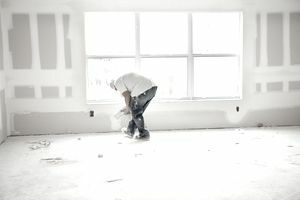 Minor fixes can be applied to drywall to prevent them from showing, getting rid of that problem almost forever. A nail pop can be described as a symmetrical hole from the face of the drywall wall or ceiling surface, approximately 3/8 to 1/2 inch in diameter. So are you just installing a new screw next to the area of the problem? There is much more than that, let's understand first why this is happening so we can put together a plan to eliminate the problem. Nail pops can show up as soon as two months after the drywall has been installed. There are many reasons why nail pops happen, and they can even be a potential sign that the building is settling or that the structure has other issues. Shrinkage: Framing lumber can be installed way in advance of the drywall and sometimes environmental factors can increase the lumber moisture content. When the lumber begins to shrink and to move at a different rate than drywall it will force the fastener to pull through the drywall. To avoid this make sure to store the lumber in a covered dry storage. Drywall Installation: When the drywall is installed improperly it will lead to nail pops. Sometimes the wrong fastener length is used, so the drywall can move easily. Remember to account for the drywall thickness when choosing the appropriate nail or screw length. Poor Framing Work: Lastly but not least, nail pops are due to poor or loose framing members. Twisted framing members, warped lumber or just failing to install the drywall as close as possible to the studs, will also lead to nail pops. Use kiln-dried lumber for framing or if the framing is installed way before the drywall, you will need to protect it from moisture. Drywall screws should be used instead of nails. Screws will allow for a better installation process, minimizing the drywall movement. Avoid fasteners within 16 inches of any wall to prevent nail pops. Screw and glue drywall. The Gypsum Association extends its screw-only on-center spacing for walls from 16 in. to 24 in. when panels are screwed and glued. Install a new screw, patch prime, and paint. Make sure you are using the appropriate screw length. To finish the drywall once again in the affected area you will need to mix joint compound and re-patch the area. Remove the loose paint and joint compound in the area. Now is the time to use setting-type drywall joint compound. This type of compound will produce optimum results as it will shrink less than the pre-mixed joint compound, but it will require additional efforts when mixing. Apply a second coat, feathering the edges past the first layer to blend the patch into the wall. Some areas will require a third coat of joint compound. All coats shall be applied using a putty knife. Remember that the mud needs to be applied evenly across the area. Let it set. Once it has hardened, sand the patch using a 100-grit drywall sandpaper. Apply a latex primer or drywall primer and paint. Using a bright light aimed it at the wall to make sure all areas have been covered and no other nail is about to pop.